This Balladins hotel is situated in Bartenheim, only a 3-minute drive from Bale Mulhouse Airport and 100 metres from the Adokart leisure complex. LCD TVs with Canal+ and Canal+ Sport and free Wi-Fi are provided in all of the rooms. 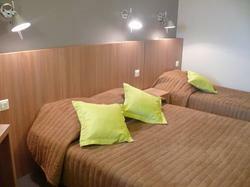 The guest rooms at the Hôtel Balladins Mulhouse/Bartenheim also include a private bathroom and a desk. The Adokart leisure complex offers billiards, football table and other diverse games. Restaurants such as Le Relais de l'Alsace, Le Texas and Le Gaulois can be found in the centre of Bartenheim, 300 metres away. With free parking on site, Hôtel Balladins Mulhouse-Bartenheim is close to the Pays de Sierentz and the Small Camargue in Saint-Louis. It is 10 km from Basel and in close proximity to the German and Swiss borders. From Colmar, Belfort, Mulhouse: direction Bâle by the A35, exit Bartenheim, then turn on the right. At the round about, take the second on the right, Z.A Le Parc 3. From Bâle: direction Mulhouse by the A35, exit Bartenheim, then turn on the left. At the round about, take the second on the right, Z.A le Parc 3. From Bartenheim: exit the town in direction of the motorway to Saint-Louis. At the round about, take Z.A le Parc 3. During the weekend the breakfast is served from 8am to 10am. Weekends and public holidays: 08:00 to 12:00 and 17:00 to 21:00. Please note that the use of the car park after the guests' stay is possible at a surcharge. Please inform Hôtel balladins Mulhouse / Euroairport in advance of your expected arrival time. You can use the Special Requests box when booking, or contact the property directly with the contact details provided in your confirmation. Features free Wi-Fi and a private bathroom and a desk. There is also a flat-screen TV with Canal+ satellite channels. This room features free Wi-Fi, a private bathroom and a desk. There is also a flat-screen TV with Canal+ satellite channels. This room type includes parking for 14 nights. Please note if you want to stay longer additionnal fees may apply.